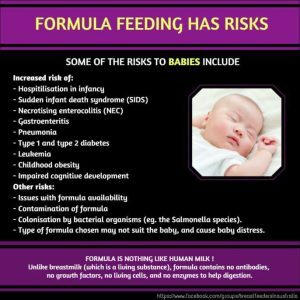 We are often asked why we don’t allow discussions and posts about formula in the Breastfeeders In Australia support group. Most of those that are reading this will know that this website was spawned by a Facebook group created in 2013. Over the years and as our group grew from those humble beginnings to over 25,000 members, our rules have evolved. In the beginning the group was small and more personal. We never used to use rules about formula, just a ‘guideline’ that ‘over zealous’ promotion of formula was inappropriate in our group. The group was small enough that we all knew each other’s stories and journeys. The core members of the group attracted like-minded members, and if a mum needed to use formula, chances were that we already knew why because we’d been with her on her journey. Then our group started to grow and grow and GROW! And I really mean ridiculous, exponential growth. As our group started growing in the thousands, we grew in notoriety. Our group started being talked about in other groups and mums were adding all of the mums they knew. After a while, it became apparent that not everyone in the group shared the same ethos as the admins. Lauren and I (because for a long time it was just us) tuned a blind eye for a long time but soon nearly every other post had formula being suggested. Baby isn’t sleeping? Try some formula. Baby has reflux? Try this brand. Worried about your supply? Formula is measurable. Going back to work? Use formula. It was like we weren’t even a breastfeeding group anymore! We deliberated over making changes to the rules, because we aren’t just faceless admins sitting in some ivory tower somewhere. We knew we had a lot of formula and mix-feeding mums in the group and we cared. And we still do care. More than you could know. But the breastfeeding mums weren’t happy. They came to our group for breastfeeding support. They already had their partner, mum, mother in law, friends, nurse, doctor or specialist telling them that a bottle of formula would solve their problems. These mums come to our group for ideas of how to overcome their struggles. Mums post in our group, venting their frustrations over people in their lives suggesting formula to them. It makes us feel undermined – like a quietly nagging voice that our body isn’t enough, we don’t have enough, we can’t make enough. It’s like a quiet accusation that we aren’t good enough. We took the plunge and changed the rules. Some members hated it. Most were (and still are) very happy at us taking some leadership on the issue. We changed the way we welcome members by tagging them in our rules post and stance on formula to reduce the chance of any mum joining our group, expecting it to be something it’s not. Our ‘guidelines’ were too vague. A group as big as ours needs firm rules that be applied to all situations. By 5000 members or so, it became completely impractical to consider posts on a case by case basis. We know from past experience that if we permit some recommendations of formula, the floodgates open and soon that’s all we see. We don’t want that. As long as we continue growing, people will continue to be upset with our rules, but it feels important to share the reasons why they are in our place. It’s not over a hatred of formula, let alone mums that use formula. It’s because it’s not conducive to breastfeeding support, which is the core goal of our group. To illustrate our stance we created our ‘FINAL WORD ON FORMULA’ document. This gives analogies and reasons behind our decisions in an easy to understand manner. Occasionally in the group we notice a trend of posts and comments that are unsupportive of breastfeeding. The aim of our group is to promote breastfeeding first and foremost, and we have taken steps to ensure formula is not recommended within this group. The aim of this post is to explain our position on formula. We have tried to be a little light-hearted to bring some levity to this situation, but we do not wish to make light of anyone’s struggles. “FORMULA IS TO BREASTFEEDING, WHAT A WHEELCHAIR IS TO WALKING” (Clancy McDonald). Imagine you trip over, just a stumble. And the first thing that is suggested is a wheelchair. And when you question if you really need to be using a wheelchair, everyone tells you “stop judging people in wheelchairs”, “there’s nothing wrong with wheelchairs”, “it doesn’t matter how you move, as walking and wheelchairs are exactly the same”, “alive is best”. Does that sound ridiculous? If a mum posts in our group asking about mix feeding or switching to formula, we expect to see responses to help her to continue breastfeeding. We have to assume that she posted in our group because she wants support to continue breastfeeding, otherwise any other mainstream mum’s group can give her the ‘switch to formula’ line. It is not our job to give her ‘permission’ to use formula, she has to give herself permission, and if she needs that kind of support then this is not the right group for that. We consider pro-formula comments (“it’s ok to use formula”, “there is nothing wrong with formula”, “formula makes my baby sleep better”, “I used formula and my kid is fine”) to be unsupportive of breastfeeding, and therefore these statements do not belong in a breastfeeding support group. “Fed is best” is a factually incorrect statement that has no place in this group. Fed is necessary, and therefore irrelevant. All methods of infant feeding are not equally best, and to pretend they are is insulting to women who work hard to breastfeed, which is the majority of the mums in this group. We consider “fed is best” and other similar statements (eg “as long as baby is fed”) to be unsupportive and undermining of breastfeeding. When we share health risks of formula use, we are not being mean or trying to make anyone feel guilty or bad. We want people to understand that giving formula can have short and long term implications that may outweigh the perceived benefits. We care about mums, but we also care about babies, and mums should be aware of facts in order to make informed decisions. It is inappropriate to seek support for using formula in a group dedicated to supporting breastfeeding. We are not anti-formula, but we won’t pretend it’s powdered unicorn tears. You all deserve better than that. You are all strong, beautiful women who should not be treated like fragile idiots. Smart women, who make informed decisions and accept the risks involved, instead of pretending they don’t exist. And please remember that just because other mothers don’t want to use formula with their babies, does not mean they think less of you as a mother. Just because I walk, doesn’t mean I spit on people in wheelchairs! Our group is well over 25,000 members now and we accept that this post may cause some mums to leave our group, however we find that as the group grows, it is necessary to clarify the group’s direction, and to redefine the boundaries.